2010 Lake Stevens 70.3: 5 hours even. Pretty solid race. Felt strong and “in the zone” the whole way. I felt I raced beyond where I “should have been” according to my preparation. 2011 Wildflower Long Course: 5 hours, 40 minutes. Something went horribly wrong here. I raced okay on the swim and bike, and survived the brutal run course, but didn’t realize how deep of a hole I had dug myself into until I still couldn’t eat or drink (or move) an hour after the race. I was carried to the med tent and given 3L of IV fluid. I finally got up (with my mom’s help) and squeezed a few drops (they wouldn’t let me leave the medical tent until I could pee!). My mom helped me catch the shuttle back to our campsite, where I laid miserably nauseous and half-awake until the next day. 2011 Long Course World Champs: DNF. I was determined to get it right this time. The swim was cancelled due to cool temps, so we started single file onto the cold bike course. I thought I had kept my pace conservative, but somewhere around mile 50 of the 74.5 mile course, I realized that something was off again. I think it must have had to do with my pacing. I was bonking. I stopped at an aid station to refuel and rest a bit, then rolled through the rest of the course while hundreds of athletes zipped by me. I took my time in transition, and decided to start the run course and see what happened. I was running very slowly just hoping that things were going to turn around. It was an 18-mile course with two loops of a double out-and-back, so I got to see my parents on the course a couple of times. Once I realized that things were not turning around, and that I would probably need to walk the majority of the course, I found my parents and told them that I did not want to finish. I didn’t want to end up sick and in the med tent again. I was very sad. This was my first DNF ever. 2012 Wildflower Long Course: 6 hours, 11 minutes. I was SO determined to race smart and nail my pacing/nutrition/hydration. I somehow did not do that. I finished the race but had to walk/shuffle a good deal of the run course to avoid the same health outcome as the year before. …After 2012, I stepped away from long course racing to focus on gaining some lost speed and figuring out my body. I completed a graduate degree in nutrition, and soaked up as much knowledge and experience as I could with regard to training and sports nutrition. I sought help from my collegiate triathlon coach, Coach Gareth, and we embarked on a long journey of discovering my triathlon potential. We are still on this journey today, more than 4 years later. 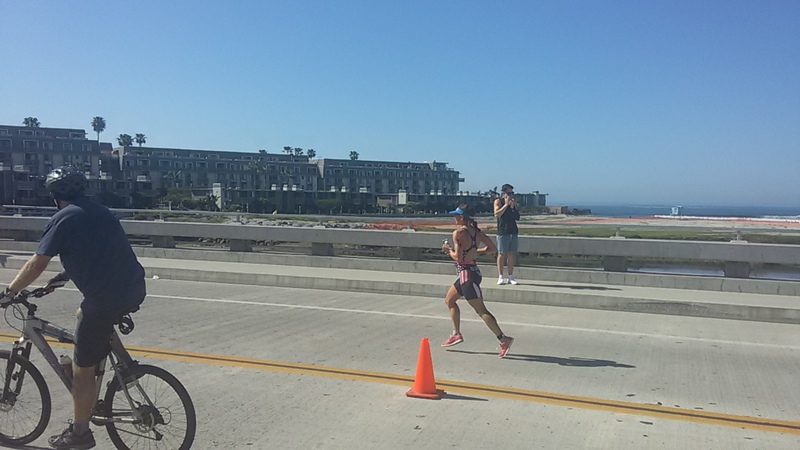 Pre race: I felt strong and fresh leading into the race–thanks Coach G! I did a better job of keeping my mind calm and not getting too amped in the days leading up. I learned from my N’awlins experience that getting my adrenaline rushing for a few days straight up to the race is actually exhausting and leaves my nervous system drained for the race itself. Brice and I traveled to O-side on Friday and got caught in some bad L.A. traffic…who’d have thought? I made it to the pro athlete briefing just in time. It was neat sitting next to Heather Jackson, Holly Lawrence, and the other really, really, ridiculously speedy people. After the meeting, Brice and I ate at a cool brewery in San Marcos. They even had a “Triathelete” Pizza, so I obliged. After dinner, we stopped at a Target *because Brice forgot his toothbrush*. This meant that I was *forced to pick up some Talenti cookie dough gelato for dessert*! Geez, Brice. Our final destination for the evening was at our Homestay in San Marcos. We were very fortunate to land an AMAZING homestay host family with beautiful, cozy, accommodations. They also had the best little wire fox terrier named “Chesty”. He was just as ferocious as a cute fluffy puppy can be, and equally sweet. I woke up and went down stairs, where Chesty greeted me with a fierce growl (until he realized who I was and again became adorably playful). I also had the fortune of hearing the family’s chinchilla chirping. I thought it was an alarm at first! Ha! I went about my usual morning routine, made coffee with my handy Aeropress and ate a TJ’s Force Primeval Bar toasted with peanut butter and jam. Nom. I grabbed my bottles for the race, and we hit the road. We arrived to find that our parking spot was in a primo location. Score! Making my way into transition was a bit hectic. I wasn’t prepared for the hugeness of this race-3k+ athletes, plus volunteers and spectators– so many people! After preparing my transition area, I headed to the “professional porta potties”. Holly Lawrence and Meredith Kessler were standing behind me for about 10 minutes during the wait, and I got to hear them talking about random stuff. It was comforting because they sounded like normal people. Even the best athletes in the world have to poop. After the gun went off, my first thought was “I forgot to start my watch!” so I opted to wait and get my times starting with the bike leg. Pretty soon into the swim I found myself swimming with Heather Jackson. I was happy to have someone to pace with. About 500 or so yards in, I didn’t see Heather anymore, but as I rounded the first left-turn buoy at the far end of the harbor I saw a line of girls at my feet. I kept my pace to the next turn, a sharp left back toward the swim start/exit ramp. This is where things got foggy (literally). I couldn’t see a thing because the sunrise was blinding me and I had cleverly decided on my clear, untinted, goggles. I had been warned about the sun coming up but shrugged it off, thinking it would be no big deal–wrong! I stopped abruptly (sorry, ladies behind me) to try and find out where I was. I sat in behind a couple of women (including Heather) and we arrived at the swim finish in just under 29 minutes. I felt like the swim had passed by pretty quickly, which is not my usual feeling–so that was good. I was ready to test my fitness on land. Starting my watch. Thanks for the pics, June! After a tour of the very long transition area, we cruised onto a bike path and eventually into the hills of Camp Pendleton. The course was one big loop. I like that because it doesn’t feel as monotonous as some of the multi-loop short course races. I was expecting some hills because I had heard about them from friends who’d race Oceanside in the past, but I was not expecting such a steep gradient on the first climb. Okay friends, I believe you now. This hill was not joking around. My focus on the course was to fuel and hydrate well and to keep my power output under control. I think I did a pretty good job with those things. I consumed a fig bar within the first mile, a nut butter-filled Clif bar around the halfway point, 2 bottles of Skratch, and a large Gatorade Endurance (course support). I think that my fueling/hydration plan worked out pretty well–it left me feeling focused and without stomach sloshing on the run. Acknowledging Brice, who was chanting his usual “THAT’S MY WIFE!!!!”. I don’t have much else to say about the bike course, except that I heard my friend Savannah cheering for me at least 3 times. She was also racing, and feeling really good apparently 😉 She ended up having an awesome debut 70.3 race and qualifying for 70.3 Worlds!! Woot! In T2, I decided to spray on some sunscreen and put on socks (I don’t usually race in socks). I am glad I did those things, because I ended up with neither a sunburn nor the gnarly blisters I have had in past races. I did end up with one blister on the bottom of my foot, but it didn’t really start talking to me until the last 3 miles of the run– not too shabby. So, I held about 6:20-6:30 pace for around 3 miles. Then, I noticed that my legs were not moving quite so fast. I stopped looking at my watch. I didn’t want to let my slowing splits discourage me. I decided to focus on trying to run steady. Around mile 6 or 7 is where I started to really need the coping mechanisms that I often rely on when things get tough: sipping Coke and splashing cold water in my face; singing up-beat songs in my head; meditating on my current favorite word: “Fearless”; focusing on keeping my shoulders relaxed, elbows pumping, and legs turning over; remembering all of the hard training sessions I’ve completed. At mile 10-or-so is where I was questioning why I had run so fast at the beginning. Would I have felt so sore and awful if I had just paced it more evenly? My focus became increasingly narrow: Just get to the finish line! It took a while for me to feel as strong and healthy as I had in 2010, but I chose to believe that it would happen…and it did! Triathlon is one sport, not three. It is a game where you have so many pennies in your pocket at the starting line, and you have to figure out where to spend those pennies to put together your best possible race. Don’t spend them all too soon, or you else will end up overcooked too early in the game. Don’t arrive at the finish with leftover pennies or else you will have not raced your best race on the day. You want to spend your last penny right before/at the finish line, feeling like you gave everything you had and played a smart hand. The challenge of long course racing is in finding your “sweet spot” where you can push just hard enough on the bike to have a fast bike split but not hard enough that you mess up your run too much. That’s where I see room for me to improve for future long course races. I would like to get a little closer to finding my limits while still erring on the side of going “too easy” on the bike. To all of the friends and family who have encouraged me (at home and on the course): Brice, Mom & Dad, Tiff, the Olivers, Buenaventura Tri Squad, Lisa, John, June, Greg, Rebecca, Keith, Danny, Betsy, Steve, the list goes on. To my brilliant coach, Gareth Thomas. As I’ve demonstrated in my prior attempts to coach myself through long course race preparations, even coaches need coaches. While I enjoy coaching other athletes, it’s nice to have someone else that I trust to look after my own training. To my favorite chiropractor, Dr. Romeo. Thanks for helping me through all of the aches and damage that comes with training and racing. You’ve helped me to recovery quicker, train consistently, and show up ready to race. To the best local bike shop, Metal Mountain Cycling, for taking care of my bike and keeping it looking tops. To my VC Swim training buddies and coaches, Coach Josh and my M26 Tribe buddies, Skratch Labs, and Verve Cycling. To the Ironman peeps who provided an awesome experience in Oceanside, and to the awesomest homestay hosts we could have asked for–the Hatalas. Before this race, I considered buying another bulky bag to fit my spare tube and tire levers under my seat. But, rather than spend extra money for something to add weight and size to my bike, I decided to wrap some electrical tape around the items under my seat and call it good. Brice used his engineering skills to rig this up for me and keep the stuff from falling off my bike. It worked out great! I highly recommend it for anyone who is riding a road bike with limited storage space and/or wearing a kit that lacks pockets to stash stuff in. I think I’ll even keep this setup for my training rides so I can finally use my bento box (on the top tube of the frame) for snacks!